When I was thinking of the perfect drink for a Memorial Day celebration, my mind started spinning. I’ve already done a number of red, white and blue cocktails and shots that I didn’t want to cover again, so I started thinking of cold drinks and then it hit me. 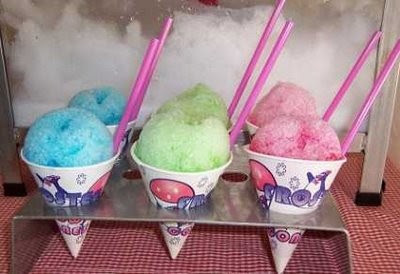 I want a snow cone. But an alcoholic one. It's like saying goodbye to that horrible, sucky, snowy winter and hello to the super sun! In a saucepan, stir sugar and water on low heat until completely dissolved. Stir in liqueur. Transfer to spouted pitcher (for easy pouring) and pour into ice cube trays. Freeze ice cubes overnight. Makes about 18 cubes. In a blender or food processor, pulse ice cubes until there are no large lumps. You may need to form into balls (warning, this is a bit messy) and refreeze before serving. Scoop or spoon into paper cups or a martini glass.